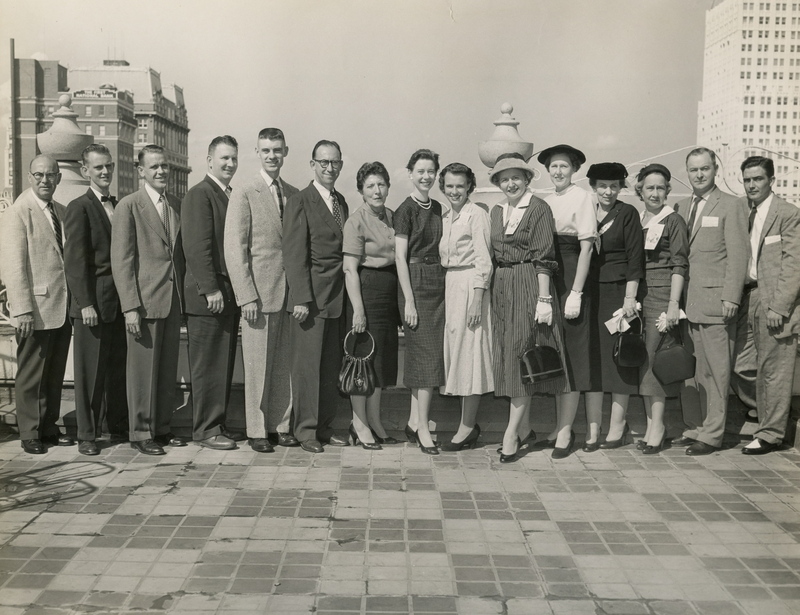 Commercial Appeal Tri-State Correspondents on the roof of the Peabody Hotel, late 1950s. Sara is in the middle, light dress. “In 1954 I talked the Commercial Appeal into letting me send in the society column which came out every Sunday, since Tom Shepherd, editor of the Commonwealth, who had replaced Botts [Blackstone] as correspondent, was not doing much with it. They agreed to let me start sending that in, and later I applied for the job of sending in all the news. Tom was just sending in what had been in the Commonwealth. Finally, in 1956, Gene Rutland, the Tri-states editor, told me I was being given the correspondent’s job, and that I would be paid fourteen cents an inch for what they used. “We realized that I would have to have a car if I were going to cover any stories for the paper so we bought a second-hand Dodge, which the children named ‘Kelly Black.’ I had not been driving for several years so had to go out and get a drivers license. We went out by the Golden Age Nursing Home for me to take my test, and I backed off in a ditch with the Highway Patrolman in the car. He laughed and said he thought I would be all right if I didn’t get out on the highway. Sara takes the Big Leap. Actually, two big leaps, hiring on with a major tri-state newspaper and getting back behind the wheel of a car. She somewhat downplays the significance of what happened here in 1954, but for this still-young (33), relatively inexperienced journalist to tag on with one of the South’s premier newspapers…….Well, that was unprecedented. Gene Rutland, God bless his soul, must have seen something in her writing and her grit that told him the Commercial Appeal‘s Delta readers would be in good hands with Sara. And at the time, neither Gene or Sara or anyone else could have dreamed that she would go from transmitting a society column and covering the occasional debutante ball to the front lines of the civil rights struggle. She was pretty much fearless when it came to news coverage. Navigating the roads on the way was a different matter altogether. For some reason (pride, perhaps), she didn’t relate the tale of Russell teaching her to drive soon after they married. Or maybe it was before they married, but I’m not sure he would have gone through with the commitment had that lesson been pre-nuptial. She apparently scared the living daylights out of him and most of motoring Greenwood before they limped back home to Walthall Street. After that, she left almost all the driving to him. Which was fine, until they moved to North Greenwood and two little girls came along. We had places to go and things to do and had to have someone with wheels. I remember ‘Kelly Black,” although I have no clue why Cathy called it that. I thought all cars had names. And I also remember Cathy’s Christmas freefall when that station wagon appeared in the Gwin garage. Here we had a living room just jammed full of Santa Claus and she was out in the driveway, wailing about a Chevrolet. I just didn’t get it. My first episode of car envy didn’t come until age 10, when Russell took me down to the Ford dealership on Main Street to see the new Mustangs. There was a candy apple red model in that back lot, and I went over the moon for it. I promised him I would be a model child for the next five years, until I got a license, if he would just to get that breathtaking sports car for me. He laughed at me. I cried. I pouted. I had a full-scale tantrum right there on the lot, until he jerked my spoiled self up and back into his company Plymouth and let me know that I would be grown with children before he even thought about buying me a car. Cathy got a shiny blue Barracuda when she finished college; I got a very used hand-me-down Heinz car, a monstrous screaming-yellow Ford Galaxie 500 that would seat about 8 people and got maybe 10 miles to the gallon. I drove it for 3 or 4 years, and then old softie Russell broke down and got me a Mustang. Not new, not red, but the car of my dreams. I wish I still had it. Sara never turned into a good driver. She was a steering-wheel-gripping, nervous, jerky mess of a driver. And even after I was grown with my own children in the back seat, she would sling that right arm across me at every stop light. 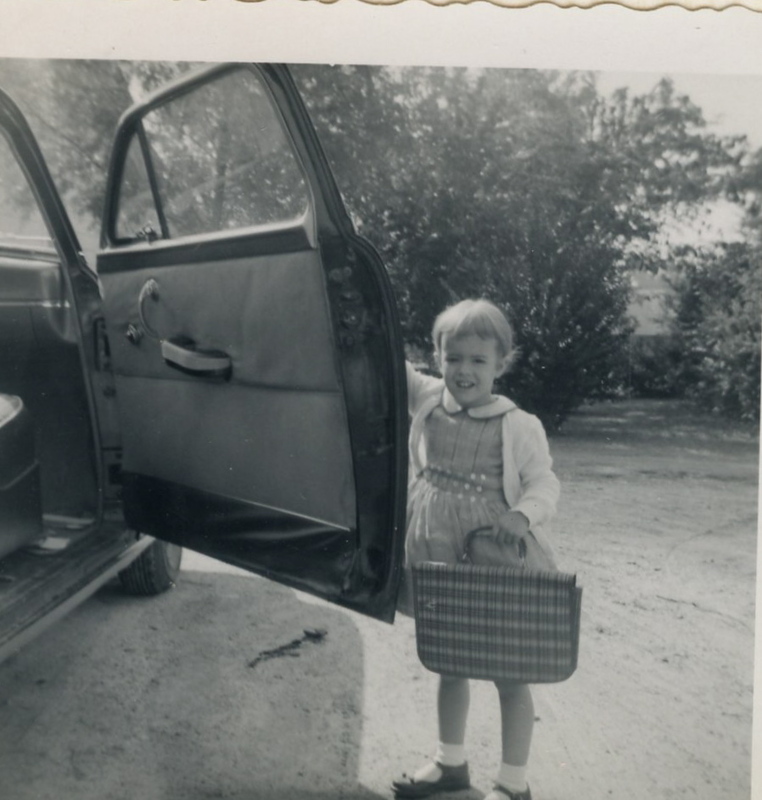 I learned early on to lean against the passenger door and brace myself for “The Arm.” The back seat was a safer perch, and I can still feel those plastic seats, the ones that would melt onto your legs in the summer heat (no one had air-conditioning) and the smell of snowcone juice soaked into the floorboards. She never once had a new car. And I honestly don’t think that ever bothered her. She was confident enough that she never had to search for her self esteem with tail fins and chrome. As will be evident in the days to come here, her confidence came with teletype keys and camera lenses. The sucking noise is especially common if she’s in the passenger seat and you are driving. Cathy, you see, likes to put on the blinker 700 feet from the turn and stop (rapidly) four car lengths before the car in front of her (just to make sure). So when normal people drive – and don’t stop rapidly but rather ease up near the car in front of them …. it prompts her to have a horrible intake of breath that sounds like a man with an axe has just been discovered in the backseat. It’s kinda a failed car ride if you don’t get the sucking noise and although my father would NEVER admit to this, i know sometimes he tries to get her to make it by driving super fast.